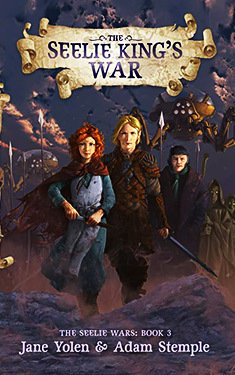 The exciting conclusion to the Seelie Wars trilogy. Full of magic, battles, and page-turning excitement, this series is a perfect introduction to classic fantasy. The war that Prince Aspen and midwife's apprentice Snail started--purely by accident--is at hand. The Unseelie Army, the evil side of Faerie, will soon invade and destroy the Seelie kingdom. Aspen is terrified, not simply because his homeland is on the verge of ruin, but because he is now, after the death of his father and brothers, the Seelie King. He is a young, untried king; a king without a battle plan. But he has Snail, his first and only friend, and the only one who can raise the army Aspen needs--an army of changelings, like her. First, however, she has to convince the mysterious, dangerous Professor Odds, the changelings' leader, who has a destructive plan of his own.